One month left of the early registration discount for YTV Trad Camp 2018! Cost is $250 if you register and pay by May 15th – cost goes up to $275 after that date. Visit https://youngtraditionvermont.org/2017/02/trad-camp/ for more info on the Trad Camp schedule and our lineup of instructors and guests. The sound of fiddles slowly bowing a traditional dance tune emanates from one room, while down the stairs the plink of ukulele strings greets the ear. Later on, you might hear the music of many young voices singing in harmony, the tapping of feet beating out the rhythm of a fiddle tune, or the laughter of kids making up a ditty or illustrating a silly song. This is Young Tradition VT’s Trad Camp, a yearly summer day camp held in the Lake Champlain Waldorf High School building. 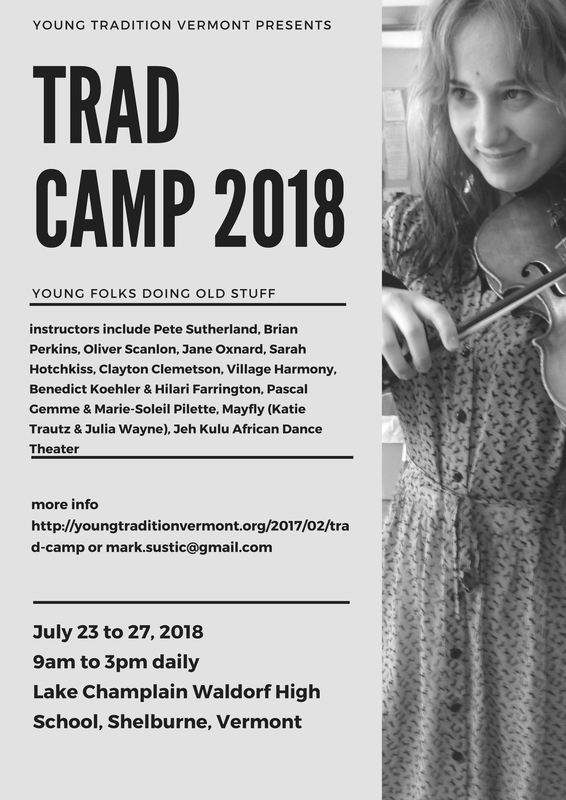 Trad Camp is a concentrated opportunity to be inspired by, learn about, and perform tunes, songs, and dances in a variety of traditional styles. At Trad Camp, campers participate in several group classes each day with a variety of core staff and guest instructors. 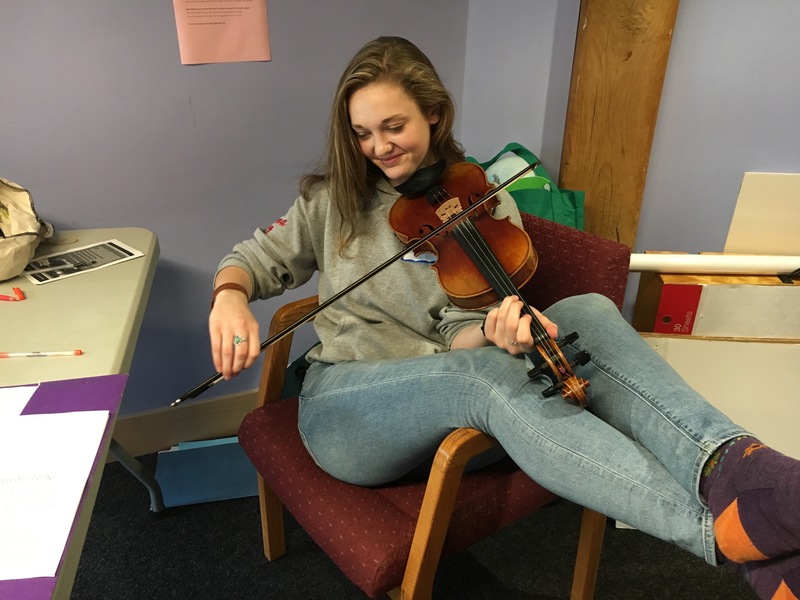 Sessions include beginner, intermediate, and advanced levels, and include subjects from mandolin, strings accompaniment, and fiddle tunes; to ceilidh dancing, shapenote singing, and making up tunes of your own! Instructors are among the best and most respected musicians and teachers in the region, and a few from other parts of the world; instructors this year include Pete Sutherland, Oliver Scanlon, Jane Oxnard, Clayton Clemetson, Sarah Hotchkiss, Brian Perkins, and Annika Amstutz. Special guest performers and instructors include Village Harmony, Jeh Kulu, Benedict Koehler and Hilari Farrington, Pascal Gemme and Marie-Soleil Pilette, Katie Trautz, and Julia Wayne. Throughout the week, there are opportunities for late afternoon/evening and post-camp showcases and performances, including a Friday afternoon finger-food potluck and showcase featuring instructors, students, and guests for friends, families, neighbors and anyone else who wants to attend. One highlight of the week is the construction of the Trad Camp crankie. A crankie is a traditional storytelling art form, where a song or story is illustrated on a long scroll which is wound onto two spools loaded on a box to create a viewing screen. The scroll is hand cranked while the song is sung. At camp, the kids spend the week collaboratively illustrating the scroll and learning to play and sing the chosen crankie song for the Friday showcase. 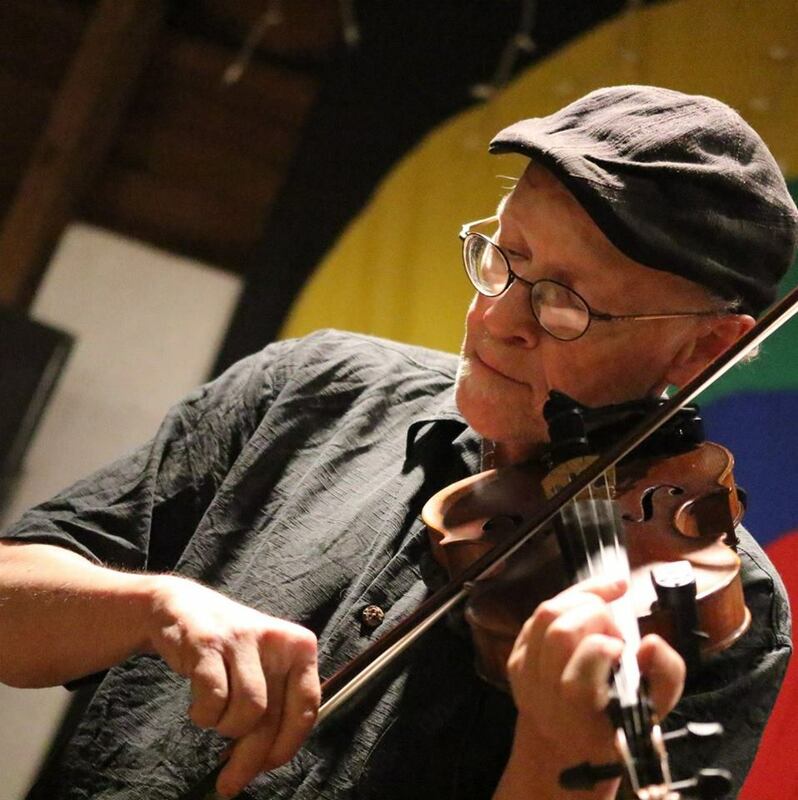 The crankie-making process is a fun and creative way to engage people of all ages in the melodic and storytelling aspects of traditional music. This will be the 3rdyear that Young Tradition Vermont (YTV) has held Trad Camp in the Lake Champlain Waldorf High School building (it was at the elementary school building on Turtle Lane 5 years ago). YTV is grateful for and excited by the opportunity to once again partner with the school and use its beautiful spaces and fill it with trad music and dance!